What do Urban Farmers do in January? Put rolls on cookie sheet. Mark the roll with a sharpie as to what will be planted in it. Fill the roll with soil. Plant seed. 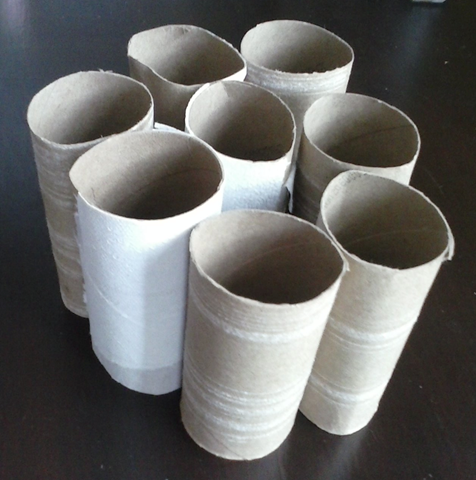 When seedling is ready to plant, dig a hole the size and depth of the cardboard roll and plant. Make sure to thoroughly moisten the cardboard before planting. Note: Any small cardboard container can be used. *Permaculture Design Principle 6: Produce no waste: By valuing and making use of all the resources that are available to us, nothing goes to waste. January, like December, is a fairly dead month for most gardeners. Of course one can start seeds in containers and prepare outdoor beds and gaze starry-eyed at all the great seed catalogues. For Kale, plant seeds at least a month before the last frost date. For those who live in North Texas, this would be around the first of February. For Okra: I'm starting mine from seed indoors February 14 and transplanting to the garden around April 8. May 11 is last spring planting recommended here in North Texas for okra. For Pepper plants: I'm starting mine from seed indoors in March and transplanting to the garden in late April. For Tomatoes: I'm starting mine from seed indoors in mid-March and transplanting to the garden in early May.